Tyler creates all of his work in a 380 square foot studio space in a former bank building. 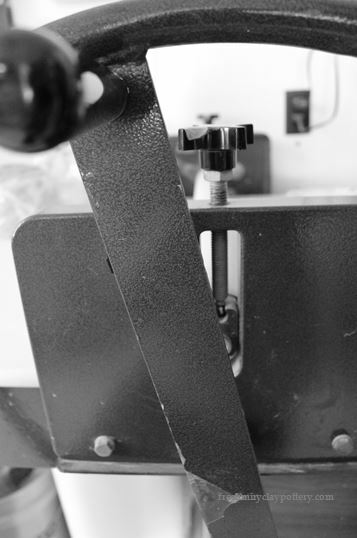 Each piece has an incredibly journey and is handled around 20 times to complete the process. 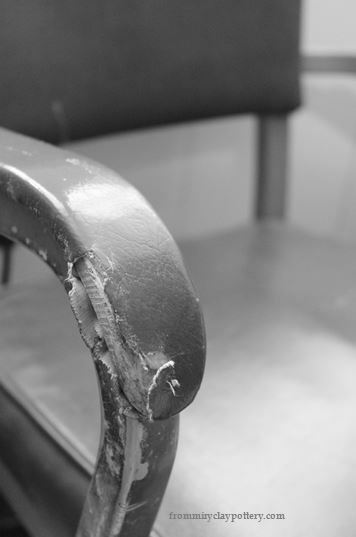 Every item is carefully thought out, created, and inspected for you. and prior to that it housed a dentist's office. Tyler goes through about 2000 pounds of stoneware clay every six months. The clay is cut with a wire and weighed to a specific amount. Each vessel is handmade on an electric potter's wheel. This is also known as being wheel-thrown. Tile and oval items are hard to make on the potter's wheel, so Tyler uses a hand-cranked slab roller to create handmade tiles for signs, plaques, and oval platters. 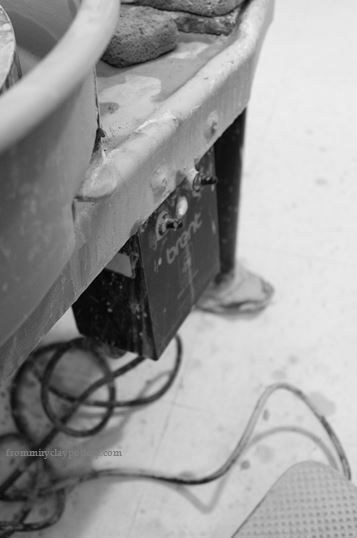 After a piece is made, it will dry over a period of time from the top down. Bottom Picture: Notice that the rim is lighter in color than the bottom. and finally it will be bone dry. If the piece dries too fast, it will crack. to stack the kiln tightly. Then fires the kiln to 1800F. 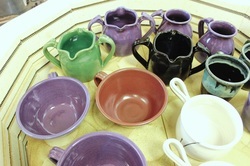 The heat of the kiln changes the pieces from greenware into bisqueware. Pieces in this kiln can touch each other, which helps the kiln be loaded tightly. When the kiln cools, Tyler will carefully unload each piece and sort them into what glaze color groups are needed. 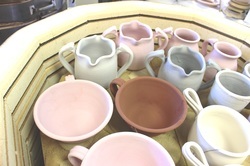 Each piece will be glazed one at a time using a variety of techniques. Glaze, in a basic form, is made up of three basic ingredients: glass former, flux, and a stabilizer. again, this time to around 22ooF. Pieces in the glaze firing cannot touch each other, which results in the kiln holding fewer pieces than the bisque firing. Once the kiln has cooled, the transformation is revealed. The glaze has melted to glass and the clay has become stone. When the kiln has completely cooled and Tyler unloads the kiln, each piece makes a tinging noise. This tinging noise is the glaze still shrinking. After every vessel is checked for flaws, they are moved to the gallery. The pottery in the gallery is very liquid. 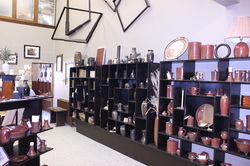 We are constantly making and selling our pottery to people all over the country. One overseas sale to London, England.